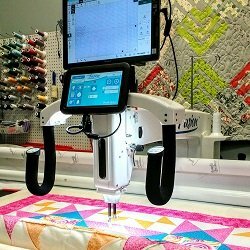 This class is designed to qualify you to rent our long arm quilting machine. This is a technical, not creative class. The fee can be applied to the purchase of a long arm machine of your own, should you decide to purchase one. This class does not include training on the Pro-Stitcher. Renters of the Long Arm may only do free hand quilting. Class fees are non-refundable. You may sell your seat to someone else, but due to the popularity of the class we do not allow refunds for cancellations.